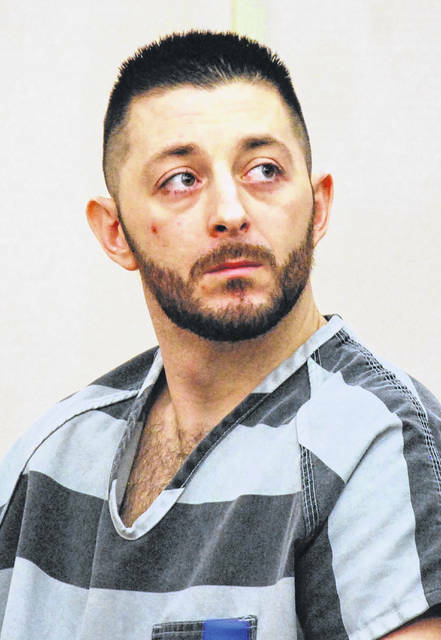 Nickolas Compton, 30, of Lima, was sentenced Wednesday in Allen County Common Pleas Court to four years in prison on a felony charge of burglary. LIMA — A 30-year-old Lima man who admitted in court Wednesday that he “messed up big time” by relapsing from his drug addiction rehabilitation on at least two occasions while in a Lima transition home was sentenced to four years in prison on a charge of burglary. A lengthy criminal record that included numerous felony and misdemeanor convictions convinced Allen County Common Pleas Court Judge Jeffrey Reed to sentence Nickolas Compton to the four-year term, despite pleas from the victim in the case — who is also the mother of Compton’s two children — for leniency. Reed said Compton would be eligible to apply for judicial release after spending six months in prison. According to court records, Lima police were called in the early-morning hours of April 18 to 499 Lester Drive in reference to a burglary. Upon their arrival they learned Compton had forced his way inside the home of the victim. He was taken into custody at that time. Compton told police he had gone to the home earlier and got into a verbal argument with the victim, who told him to leave and not return. Compton complied, but did return later and again entered the residence without permission. In court on Wednesday, the victim said she wished she had handled the events of that evening differently and asked Reed to help Compton in his battle against addiction. Compton addressed Reed prior to sentencing and accepted responsibility for the April incident, which occurred while he was still under court-ordered transitional care after completing a four-year prison sentence on another robbery charge. He admitted his failures in previous attempts to kick the drug habit.